Comments on: "Ernst Toller Quotes: Slogans which deafened us so that we could not hear the truth." 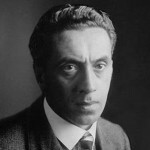 Ernst Toller was born in Samotschin, Posen, Prussia. He was a German left-wing playwright, best known for his Expressionist plays. He served in 1919 for six days as President of the short-lived Bavarian Soviet Republic, and was imprisoned for five years for his actions. In 2000, several of his plays were published in an English translation. He wrote several plays include: transformation, Masses Man, The Machine Wreckers, Hinkemann, Oops, We're Alive!, The Fires, Letters from prison, and Mary Baker Eddy.